The Yarra isn’t the only river in Melbourne worth checking out. The Maribyrnong River, which pours into the Yarra from the northwest corner of the city, is bordered by a lovely paved shared use path which is separated from the water by nothing but a stand of palm trees. Clyde Street and Raleigh Road, where the tram lets off, is a great place to start out — allowing you to explore first the west, then the east bank of the river before returning on a set of footbridges. 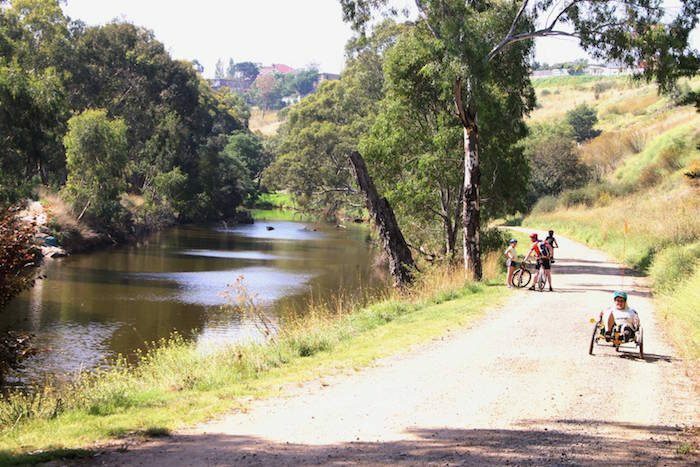 This route encompasses the Maribyrnong Reserve, Aberfeldie Park, Fairburn Park, and Pipemakers Park, but the highlight is the stretch of path known as “The Boulevard” along the east side. Maribyrnong is also home to Parkrun, a free group 5k held every Saturday morning. You can see the course map and learn more here. The Clyde Street and Raleigh Road train stop will let you off at a central location of the trail.